This view of the Sydney skyline across Darling Harbour is from Wharf 7, in the inner city suburb of Pyrmont. 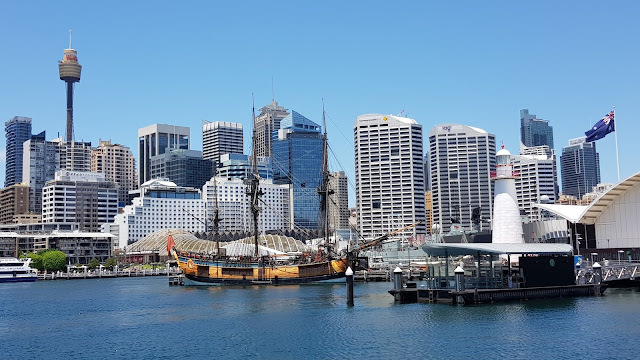 Some of the landmarks seen here are Sydney Tower, King Street Wharf, Endeavour replica, Pyrmont Bay ferry wharf, the Cape Bowling Green lighthouse and the Australian National Maritime Museum. Linked to: Weekend Reflections, All Seasons. Love seeing the Endeavour replica with its reflections in the harbor. Your skyline picture makes me want to come back. Perhaps, Sydney is on my run-to list. I posted the comment with my Android Galaxy smart phone, I haven't been able to comment here from my computer using MS Explorer with Windows 8.1. Thanks for doing that, Jim. I've had quite a few similar comments in recent times. It seems Google restricts comments for people who don't have a Google account, which is frustrating. Grand ship! Although I'm very glad I didn't have to go to sea in it. Can't see much of the Australian National Maritime Museum, but it is still my favourite building in Darling Harbour.